Turmeric is one of the most known culinary spices which has recently gained great popularity due to newly discovered anti-cancer properties of this medicinal herb. It is the key element of curry spice, a combination of spices extensively used in Indian, traditional Chinese, Indonesian, and other cuisines. The herb Curcuma longa belongs to the family of ginger and originated from South Asia, though now it is being cultivated in many warm areas. 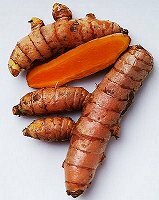 The main ingredient of this herb, curcumin, is the very ingredient known for anti-cancer properties, and this very ingredient is also responsible for the spicy and slightly bitter taste of curry spice. It is considered that the highest quality turmeric spice is produced in modern India and Pakistan, but there are many producers located in Europe and the US, which use high quality herbal materials (turmeric root) and the most modern technologies. As a medicinal plant, turmeric and turmeric benefits have been used for centuries in Ayurvedic medicine and in Traditional Chinese medicine for curing a great number of health conditions. In addition, this spice played a role in preparing various homemade remedies and effective natural cosmetics: in particular, it is used for making natural dying products, both for hair and for clothing. In South Asian cuisines, turmeric is used to flavor various dishes, starting from soups and meat, and ending up with dairy products or pastry. In some industrial technologies, turmeric and curry is used as a natural agent for preparing marinades, sauces, etc. It goes perfectly well with mustard, and this combination of natural remedies are used for stimulating properties in cosmetic and hair care product industry. Below, check out a list of turmeric benefits which have been known since the early times, or were recently discovered by modern time’s studies. Turmeric benefits include very strong anti-inflammatory powers which can be used to treat all sorts of skin infections starting from simple cuts and wounds and ending up with acne and dermatitis. Both Turmeric powder and turmeric extract can be used for this purpose. Excellent antibacterial properties of this plant can work great to calm down the symptoms of common cold or a flu, as well as speed up the recovery. The easiest remedy is adding a little of turmeric root powder to a glass of milk. The mentioned benefits of turmeric can also relieve the condition of the patients who suffer from asthma. According to the latest studies, turmeric spice can be used to lower insulin resistance, this way assist those patients who suffer from diabetes melitus. It was found out that turmeric also has good analgesic and pain-relieving properties. Combined with anti-inflammatory benefits, it is possible to use this natural remedy to treat arthritic repeated pains in joints. It can be achieved by taking turmeric powder capsules, or by preparing special poultices with turmeric powder and placing those to the aching joints. As one of the most recent studies has shown, turmeric and curcumin can be used to improve brain function and prevent various types of dementia, including Alzheimer’s disease, one of the most common and the most serious types of dementia. Read more about this study here. Aiding weight loss by speeding up fat metabolism is one of the most valued benefits of this medicinal plant. 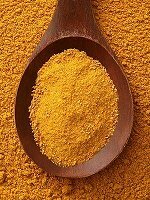 A great women start using curry spice extensively in order to enjoy the mentioned turmeric benefits. Historically, turmeric is known as excellent natural remedy to stimulate detoxification processes in liver. A research suggested that using turmeric can be effective as a natural solution to slow down multiple sclerosis development. Finally, the properties of turmeric to slow down cancer cell development and prevent cancer are considered among the most impotrnat discoveries of the last decade. This natural remedy can be used to reduce the risks of prostate cancer, breast cancer, skin cancer, leukemia, and other types of cancer. Add some turmeric root powder to your daily diet in order to enjoy the mentioned benefits of this amazing natural remedy.